Why the forward sloping seat? It also exerts less pressure under the thighs, so they don't support much torso weight (another cause of slumping). 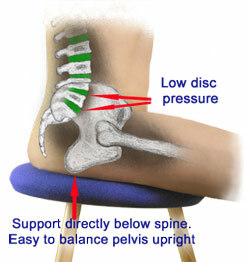 This makes sure the torso weight is supported directly below the spine. Why is it on a rocker? The rocker is to encourage balance and poise. We have a wonderful sense of balance for standing and walking, which we take for granted because we find it so easy. But we seldom get the chance to balance when sitting. It is easier to sit upright when you are balanced. It is relaxing yet invigorating at the same time. It is easier to be alert and attentive than when your body is allowed to become lifeless against a backrest. And when you are alert and attentive it is easier to sit upright. Even when sitting still you feel the freedom to move. (You will always be making imperceptible movements to maintain your balance, and these will keep your balancing reflexes working at their best). As long as the pelvis remains in balance it can support a lot of bodyweight. It takes very little muscular effort to keep it upright because the support is directly below where the weight presses down. It is not true that sitting upright needs strong back muscles. If you are using much effort you are sitting inefficiently and will tire your muscles. You do not need to strengthen your back, only to take away the forces that tip you off balance. Many people find they sit like in Fig. 2 without trying, and find it extremely comfortable. This is because it's a healthy natural spine alignment. For a healthy back this is the single most important thing you can do to keep it healthy. For an injured back this stops the cause of most of the damage, and allows healing to begin. Who is posChair 1 for? It is ideal for computer users, office workers, musicians, artists, therapists, craftspeople and more. 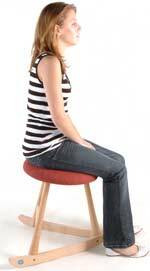 Use it anytime you want to sit upright and attentive, yet be relaxed and comfortable. People interested in using their bodies well, who perhaps do yoga, tai chi, or Alexander Technique, will particularly appreciate posChair 1. Won't I miss the backrest? You have got used to needing a backrest because most seats tip you back off balance. On posChair 1 you are no longer being tipped backwards so many people find a backrest simply isn't needed. Muscles often try to protect you after an injury, but can become habitually tense causing chronic backache. They can now begin to let go as you discover how easy it is being upright just by balance. The stool's gentle movements add to the relaxation. To treat or to prevent back pain, doctors now recommend frequent movement. 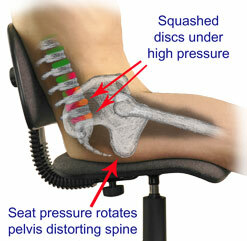 This is difficult if you have to sit for long periods - unless you use a seat that can move. Ligaments that have been stretched can begin to shorten and protect the discs again - if you minimise the time you sit with a slumped pelvis. If you suffer from osteoporosis or another condition it is even more important for you not to distort your spine when you sit. This is one of very few seats designed with an insight into Alexander Technique - its balance and movement gently remind you to remain aware of your whole body. Some people find it helps them to learn and use the technique. There are other forward sloping seats on rockers, the most common of these are kneeling chairs. They work by having such a steep seat angle that the knee rest is needed to stop you sliding off. These do work very well for some people, but most of those we have spoken to find the fixed, bent leg position, and pressure on the knees becomes restrictive and uncomfortable after a time. They said our Wave Stool had more natural freedom for knees and legs, and posChair 1 has the same freedom. It is also quicker and easier to stand up and sit down, so you're likely get up and walk about more often.